The Turbotron AI offers an analoge 4-20mA output instead of the standard pulsed squarewave signal and is attached by means of an M12 x 1 connection, the power supply is 18-30VDc. The Turbotron VE offers a switched output with a possibility of 16 different switch points selectable by means of a rotary switch, the set point are dependent on the VT model that the VE unit is used with (please see data sheet for further details). The Turbotron VE also has a display to show flow and lack of flow conditions and also attaches to the VT sensor via an M12 x 1 connection. 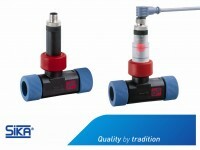 We recommend that customers order both the VT flow sensor and the AI or VE together in order that the units can be factory calibrated.